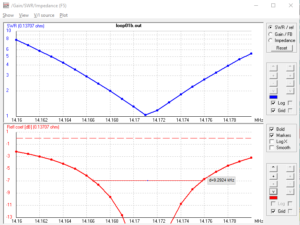 Recent postings to List your favorite SOTA antenna on QRZ.com referred to an experiment Comparing the performance of an inverted vee dipole with a small transmitting loop on 20m as propaganda. 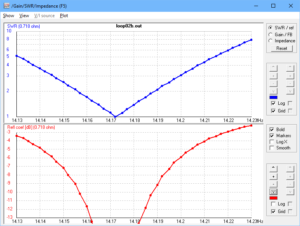 The experiment above states The manufacturer of the loop gives a calculated efficiency of 39.754% at 14174 kHz . This is very similar to that claimed by Chameleon of their P-Loop2, so it will be used as a study example. 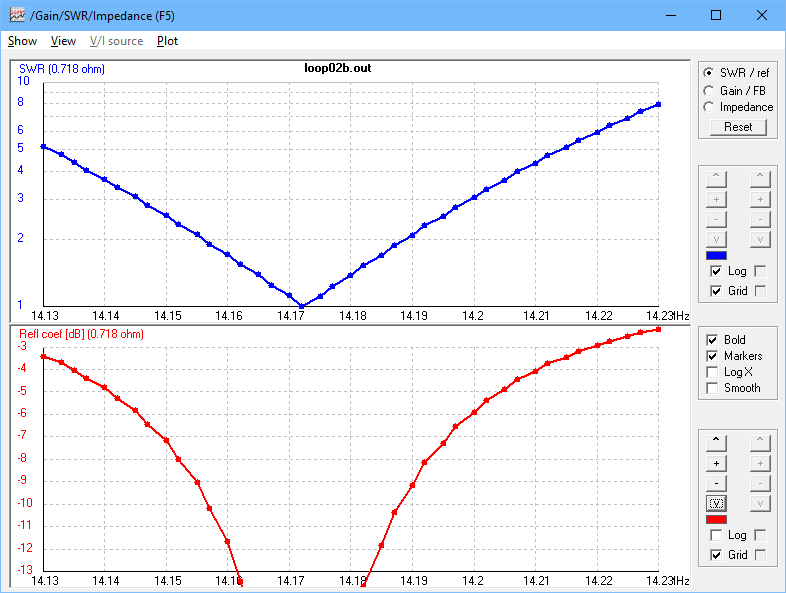 compare the NEC-4.2 model in proximity of ground with realistic losses to Chameleons published VSWR curve. Chameleon gives the following table on their website. An extract from the AA5TB model using Chameleon’s stated dimensions. The efficiency figure reconciles exactly. 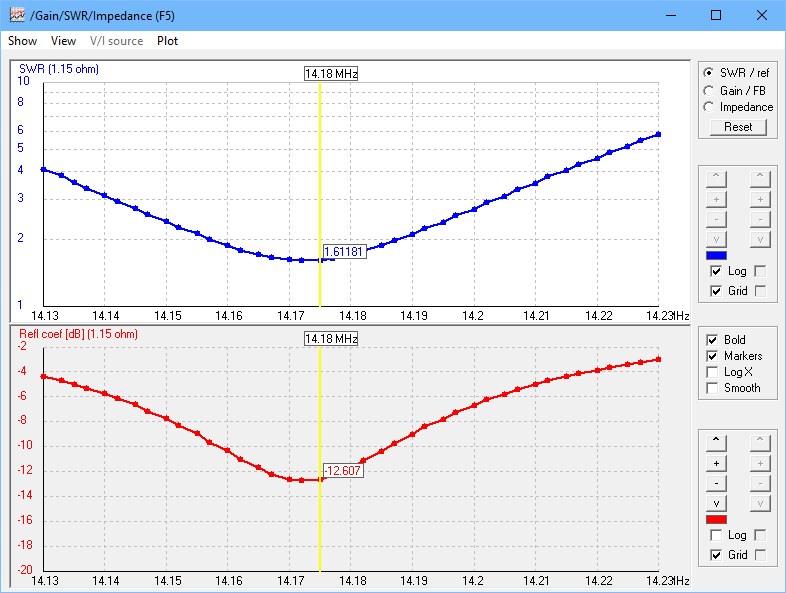 Above is a VSWR plot of the basic loop as per the AA5TB model. The most notable difference is the half power bandwidth (BW@VSWR=2.618) is about half that predicted by the AA5TB model. It reconciles well in other respects (eg radiation resistance (Rr), loss resistance, tuning capacitance, radiation efficiency). AA5TB’s half power bandwidth is half that of the NEC model. The NEC model is revised to place the loop centre at 1.5m above average ground (0.005,13). 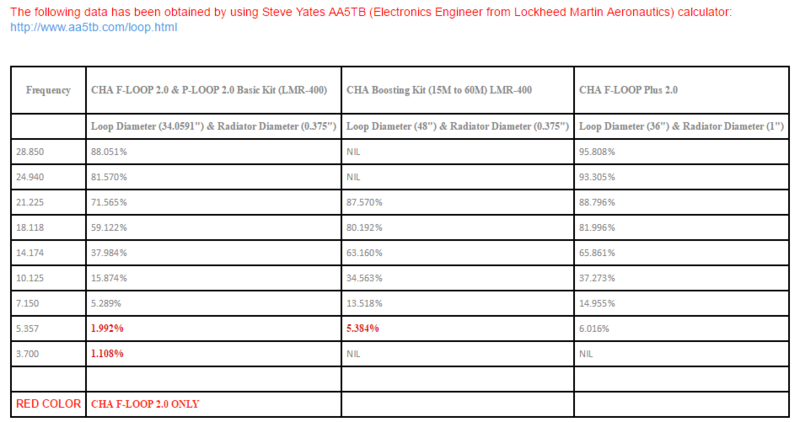 From the above, we can calculate Rr=0.1619*0.21=0.0340Ω, quite a deal lower than AA5TB’s 0.05461Ω and that will significantly affect radiation efficiency which is now 16.19% against AA5TB’s 37.984%. 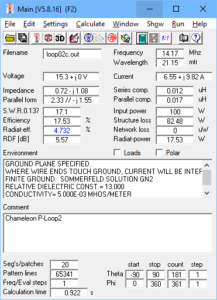 The NEC-4.2 model in proximity of ground predicts significantly lower radiation efficiency. 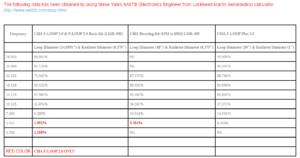 A bulk resistance of 0.25Ω was added to the capacitor load to represent the ESR of the capacitor. The value is not excessive for the type of capacitor typically used, and could be an underestimate. 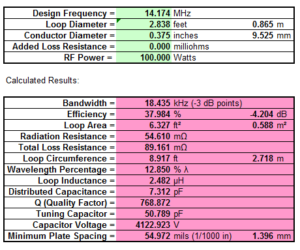 Loop conductor is reduced to 8.1mm in accordance with Times Microwave’s LMR specifications (0.319″) as against Chameleon’s 0.375″ used in the AA5TB model. The 20 loop segments were loaded with 0.02Ω to represent the loss resistance of the braided outer conductor of the LMR400 used. Again this could be an underestimate. Above, the new VSWR plot. Notably the half power bandwidth is increased to about 46kHz. From the above, we can calculate Rr=0.04732*0.718=0.03398Ω, quite a deal lower than AA5TB’s 0.05461Ω and that will significantly affect radiation efficiency which is now 4.7% against AA5TB’s 37.984%. 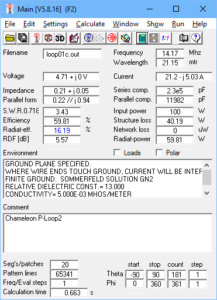 The NEC-4.2 model in proximity of ground with realistic conductor and capacitor loss predicts significantly lower radiation efficiency. 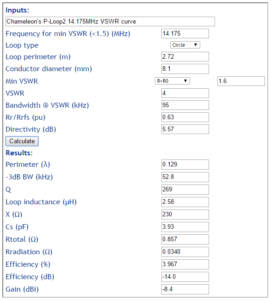 Chameleon publishes a VSWR curve on their web page. 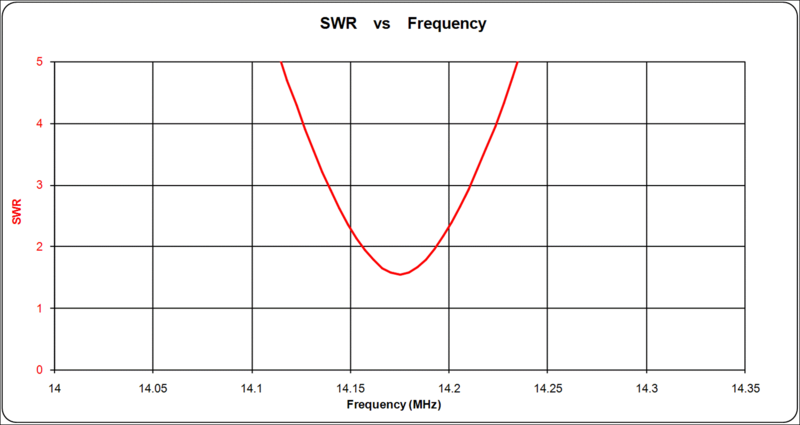 Unfortunately, the VSWR curve is not for a matched antenna, it has a minimum VSWR of 1.6. Adjusting Ro in the NEC model for each of the two possibilities (Ro=Rin/1.6 and Ro=Rin*1.6) gives a solution that reconciles. 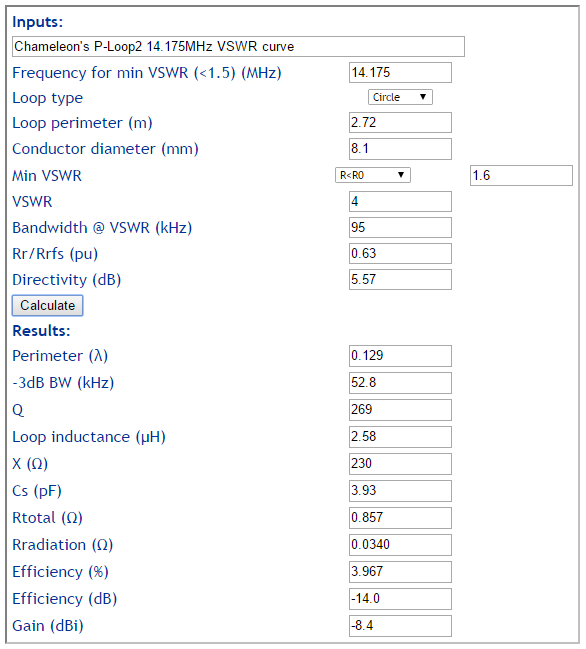 The above VSWR curve is for Ro=Rin*1.6 and it reconciles quite well with Chameleon’s curve, though Chameleon’s is perhaps a little wider bandwidth. 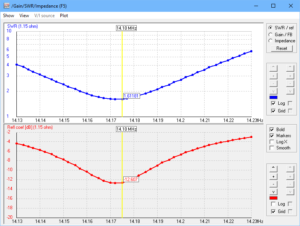 Chameleon’s VSWR curve does not reconcile with their cited AA5TB model. 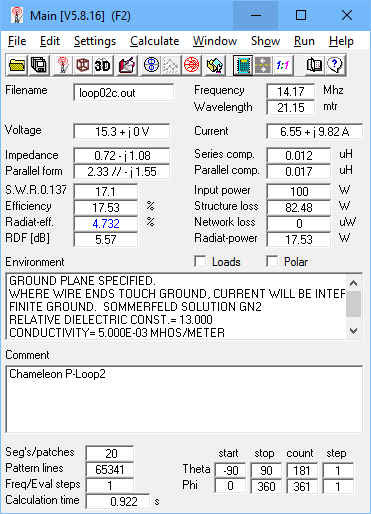 Chameleon’s published VSWR curve is close to that of the NEC-4.2 model near ground and with realistic conductor and capacitor loss. 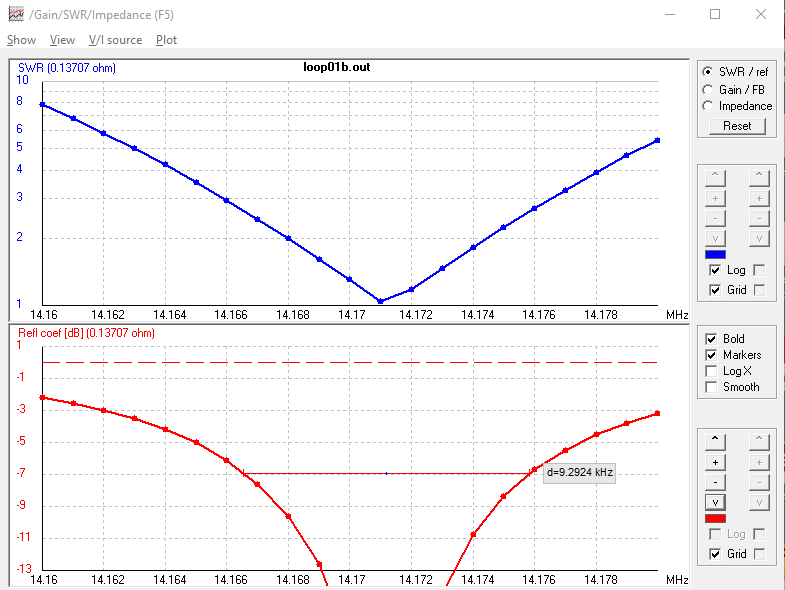 Using the Directivity, Rtotal and Rr figures from the NEC model, we can estimate the behavior of the Chameleon’s loop in proximity of ground using their published VSWR curve given above using Calculate small transmitting loop gain from bandwidth measurement. 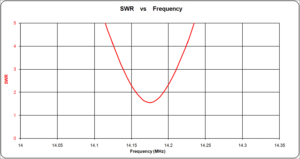 This reconciles fairly well with the NEC model with realistic loss elements, Chameleon’s VSWR curve indicates a slightly lower radiation efficiency. The original experiment cited at the start compared WSPR signals received by a number of stations at moderate distance, and a key parameter becomes not so much the maximum gain of the two antennas compared but the gain at the relevant path elevations and the higher dipole will tend to have relatively better gain at lower elevation than the lower STL, so that further disadvantages the STL in the test scenario. This factor would be additional to the relative maximum gain of both antennas. 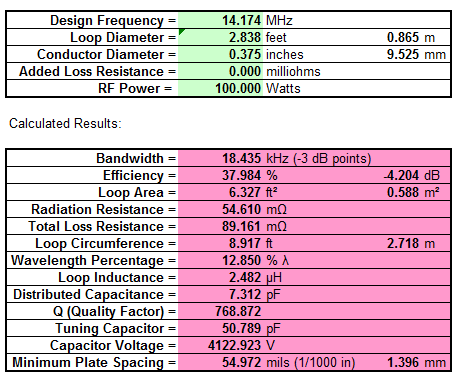 That is not to suggest that the test somehow set out to disadvantage the STL, both antennas were quite typical of SOTA deployments and the relative performance over moderate distance paths is highly relevant to that application. Little wonder that its estimate of efficiency at 38% is 8 times that of the realistic NEC-4.2 model at 4.7%, an overestimate of around 9dB. 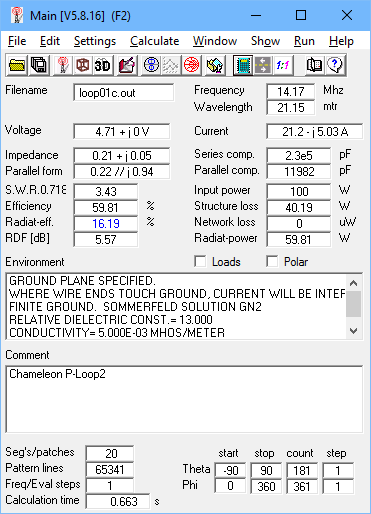 Chameleon’s published VSWR curve reconciles reasonably with the realistic NEC-4.2 model and analysis of it suggests radiation efficiency on 20m is around 4%. Though the posters to the thread mentioned earlier have waxed on for pages, at this point none have cited credible measurements to question the outcomes of the original experiment. Certainly little credible science contributed.